NYC, 02/07/2019, 6:00PM. 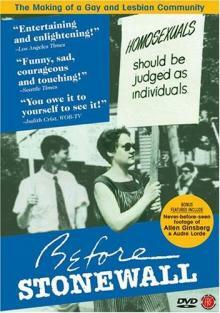 Before Stonewall (1984): Emmy winning documentary on LGBT rights. 87 min. Directors: Greta Schiller, Robert Rosenberg (co-director). Starring Rita Mae Brown, Maua Adele Ajanaku, Red Jordan Arobateau. In 1987, the film won two Emmy Awards for Best Historical/Cultural Program and Best Research. Before Stonewall was nominated for the Grand Jury Prize at the 1985 Sundance Film Festival. It won the Best Film Award at the Houston International Film Festival, Best Documentary Feature at Filmex, First Place at the National Educational Film Festival, and Honorable Mention at the Global Village Documentary Festival.